There are several elements of a loan that should be analyzed. While one of these elements may suggest one type of loan, another may require a different type. You must weigh each ingredient separately and collectively. You will find that your answers to the questions below will ultimately determine the type of mortgage that best fits your needs. To assist you in the entire mortgage process, we have put together several important features that help explain what you need to know to obtain a favorable mortgage to finance your property. Key mortgage terms, a review of the process, understanding the credit scoring system, mortgage calculators, interest rates and of course FAQ's are all included. Please all download or Home Buying Guide that provides addtional tips. 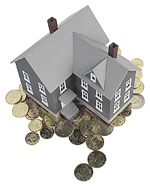 We work closely with many Maine banks, mortgage companies and financial institutions. We can recommend trusted professionals to guide you through the process and obtain the lowest interest rates available. Contact us for recommendations.